San Antonio currently ranks as the 28th most Expensive US city for renters, as of our latest February National Rent Report. To examine further, we analyzed several thousand active listings from this January to determine the most Expensive Neighborhoods to rent an apartment, house or condo. Listed here are the current statistics for renting a two-bedroom unit in the highest priced areas in San Antonio. 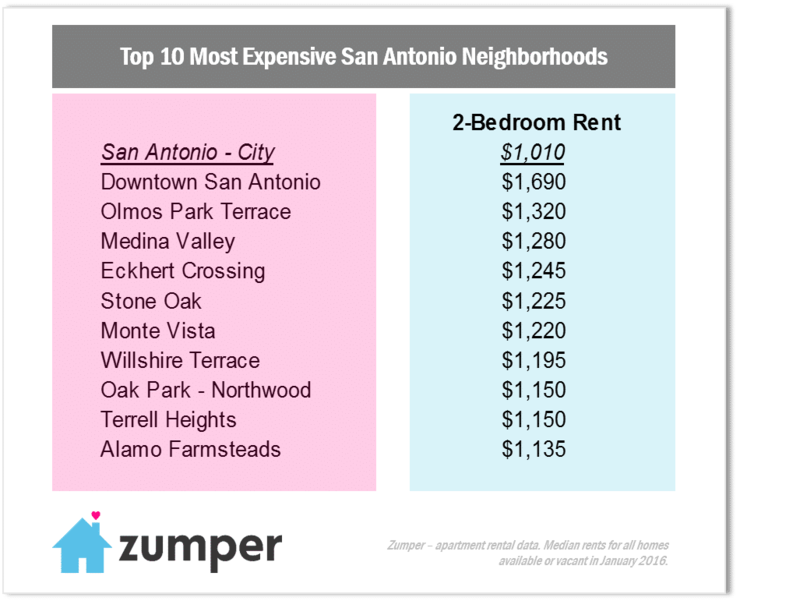 Shown above are the top 10 most expensive neighborhoods to rent a home in San Antonio, with $1,010 being the median rent for all two-bedroom units available across the entire city. The top 15 most expensive neighborhoods, as shown in the chart below, range in price from $1,690 at the top end to $990 at the bottom end. Renting in Downtown was the most expensive at $1,690, while renting in the neighborhood of Beacon Hill fell below the city median at $990/month. Stay up to date with Zumper news by following us on Facebook, Twitter, or Pinterest. Looking for a new place? Search over 1,400 apartments for rent in San Antonio, TX right now.